There is a new playground and water feature being installed at Howard Springs Nature Park, about 35kms south of Darwin. The playground is close to completion but the waterfall and adjoining rock pools are already proving to be an enjoyable outing. The pools are about calf-high so good for littlies to paddle around in, and adults to laze in. The water is salt-water treated, not chlorine which makes it very pleasant. The waterfall packs a punch and provides an excellent shoulder massage. All in all, it looks like being a great success. 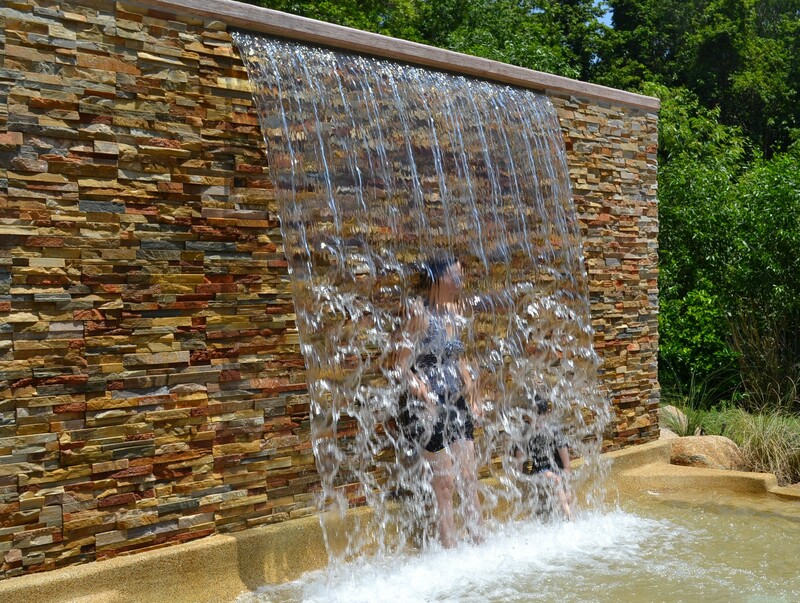 The ability to stand behind the waterfall is enjoyed by adults and children alike. This entry was posted in 365 Project, Sightseeing, Things to do, Top End NT and tagged Howard Springs Nature Reserve by cassmob. Bookmark the permalink. It looks wonderful, especially on a hot day…, when just the sight of the water is cooling. It’s lovely just to blog in the pools too 😉 Oh dear, blogging on the brain…I meant “Blob”. That looks wonderful! It’s cooling off here in Atlanta but there were days this summer when that fountain would have been so welcome! You guys had a really hot summer this year didn’t you? Our Build Up has well & truly started here so it’s hot and humid, the latter being the “killer”. Pools, waterfalls anything, are a treat.